Youth coach Jeremy Knox, accused of instructing a minor pitcher to intentionally pitch at an umpire, has been fired from his team, and the team has been banned from the sports complex where the incident occurred. Screenshot from the incriminating video. 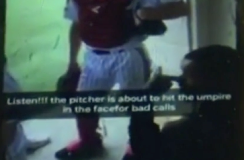 According to KHOU, former EvoShield Canes Texas coach Jeremy Knox allegedly told a player during a Memorial Day weekend tournament, "You hit the [f*ing] umpire right here in the [f*ing] mask. Right here. Hit him right here. Just throw it right here. If he gets outta the way, fine. If he doesn't, [f*] him." Knox's alleged instruction was captured on video posted to an unidentified Snapchat account and anonymously forwarded to the opposing coach, who posted it on Facebook. KHOU identified the person on video issuing the command as Knox. The report states that Knox, who was a first-year coach with EvoShield Canes Texas—and who, according to an administrator at the sports complex where the incident took place, had previously been banned from the property and shouldn't have even been on the field or in the dugout during the game—was dismissed following discovery of his conduct. EvoShield Canes TX terminated Coach Jeremy Knox Tuesday, May 30, 2017 immediately upon notification of the improper behavior displayed this past weekend during a tournament game. Our organization's core values are to teach our players how to succeed on and off the field, develop their knowledge and understanding of the game, demonstrate respect towards others by practicing good sportsmanship, and most importantly establish the highest level of integrity at all times. Unfortunately, Coach Knox's actions did not represent or align with how we teach our players to play or act; this is absolutely unacceptable and will not be tolerated at any level of our organization. Accordingly, Coach Knox was terminated immediately. On behalf of our organization (EvoShield Canes TX), we apologize to the tournament officials (Perfect Game), the tournament host (Premier Baseball of Texas Complex), the umpire involved, all players, parents, and spectators that witnessed this event. It is our responsibility to teach our players to uphold our core values. Perfect Game CEO Brad Clement stated, "There is no place in the game, at any level, for this type of accused behavior." Two EvoShield Canes Texas assistant coaches and two players were ejected following the violative pitch. It wasn't apparent whether the pitch, like Knox allegedly instructed, was thrown at the umpire's head. Nor has it been proven whether Knox actually engaged in the misconduct that allegedly appeared on the video posted to social media, though EvoShield Canes TX did terminate Knox for "inappropriate" and "absolutely unacceptable" behavior. KHOU reported that attempts to contact Knox were unsuccessful. According to the report, Premier Baseball of Texas Sports Complex has since banned the EvoShield Canes TX team, while Knox "wasn't even supposed to be on the property, let alone in a dugout." The circumstances under which the Premier Baseball of Texas Complex originally banned Knox were unclear, as were the circumstances that led to a previously-banned coach being on the property in the first place. Texas State photo of "Jeremy Knox." A Houston, Texas LinkedIn profile with the name "Jeremy Knox" indicates its owner served as a coach at The Kinkaid School, and also listed experience as a scout for the San Diego Padres. 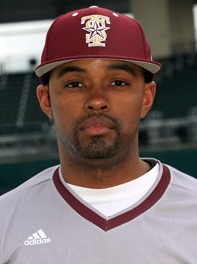 The Texas State University's baseball program lists Knox as a former volunteer assistant coach, and at one point, Knox was affiliated with Houston Heat Baseball, serving as a travel ball coach in Texas. An archived page from The Fort Bend Texans Sports Association indicates that Knox is a former college baseball player, who played at Galveston College (2001-03) and Southern University (2003-05). The 2015 Texas State media guide listed Knox's alma mater as Southern '05. Section 22.01(c) of the Texas Penal Code is called "Assaultive Offenses," and introduces enhanced penalties of a Class B misdemeanor for a non-sports participant who knowingly threatens—amongst others—umpires or referees "while the participant is performing duties or responsibilities in the participant's capacity as a sports participant [or] in retaliation for or on account of the participant's performance of a duty or responsibility within the participant's capacity as a sports participant." Intentionally, knowingly, or recklessly causing bodily injury to another is a Class A misdemeanor. As we have seen time and again, home plate umpires can suffer devastating head injuries, including concussions, after being hit in the facemask. Of note, MLB umpires Dale Scott, hit in the head on April 14, and Tony Randazzo, hit in the head on May 12, have not returned to the field since their respective injuries. The KHOU report did not indicate whether any injuries occurred during the Memorial Day weekend tournament, nor whether any criminal charges were being considered, and indicated the allegations against Knox purportedly captured on camera were yet to be proven one way or another.